As a way to say thank you for ordering my recommended action cameras through my recommended websites, I want to give you some free bonuses. When you purchase any action camera or accessory through a link on this website, you will receive not one, but TWO free downloadable ebooks! 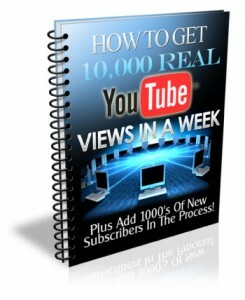 This simple guide will help you get views to your videos! You’ll learn things like.. This ebook guide is a real world $37 value but you can download it 100% free of charge when you buy an action camera or accessory through any link on my website. But to sweeten the deal even more, here is another Bonus for you..
You’ll also get to download this short report that lists the 5 most popular accessories people buy for their action camera to have the most fun and get the most out of it. Step 1. Click on my website links and visit the online retail stores I am affiliated with (current affiliated merchants are pointofviewcameras.com, amazon.com, ordercameras.com.au) and make a purchase of any action camera or accessory. Step 2. Send me a copy of your receipt/order number and total amount of purchase to: support [at] driftcam [dot] com or use the Contact form on this site with the Subject line “Drift cam bonuses”. If the one you aren’t looking for is here, search using the categories on the right.